Dublin Mini Maker Faire This Weekend! 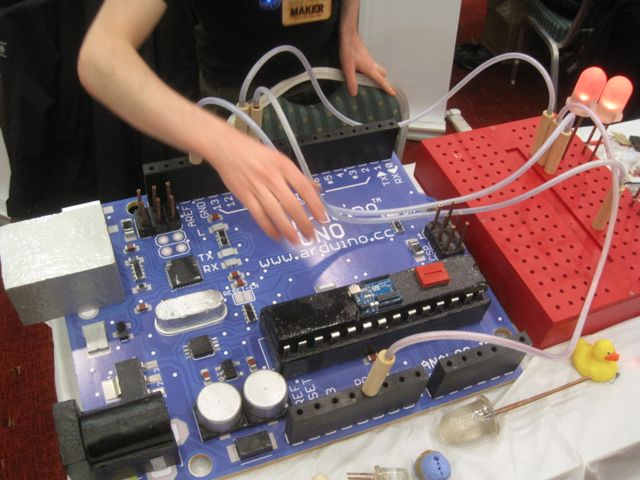 Dublin, Ireland’s second Mini Maker Faire is set for Saturday, July 27. Last year’s event drew 5,500 attendees and 35 maker exhibits. This year’s free event promises to be bigger with even more makers. In particular, there’s been a jump in the number of fabrication makers who will be showing off everything from homemade CNC machines to 3D scanning booths. The fair takes place on the hallowed grounds of Trinity College. Highlights include learning to hack with the Dublin hackerspace TOG, getting your Riverdance on with electronic tap dancing shoes, and scratching old audio cassettes on a giant turntable. TOG will be showing off their giant Arduino board. The Maynooth Maker’s Club will let loose a sumo competition robot and invite fair goers to enter a sensor glove-driven virtual world. Dalriada School’s robotics club will exhibit an educational robotic kit based on Raspberry Pi while sculptor Donnacha Cahill will create a spectacle by combining hot metal forging with art and craft. And that’s just for starters. Come to faire to see it all.